Earlier this week I watched the film "Blow-Up", by Michelangelo Antonioni, filmed on location in London in 1966, and I was startled to recognise within the first five minutes a road in Peckham that I cycle down nearly every day. As you can see, very little has changed. I also learned some interesting local history as a result of sketching here - it was the site of a workhouse built in 1878, which from the 1930s became Camberwell Reception Centre, one of London's largest "dosshouses", which is how it's shown in the film. It's now a block of flats. One thing I liked about the film was the choice of locations, especially coming from a foreign director; it's often held up as capturing the "Swinging London" of the Sixties, yet Antonioni deliberately avoids the iconic city shots - no Waterloo Bridge, no Trafalgar Square, no Houses of Parliament etc. Instead, most of the exterior shots are of nondescript backstreets and grimy alleyways. The exceptions are Regent Street and Picadilly, both of which feature as barely more than gateways to more narrow backstreets, and the park, which is similarly small, unassuming and anonymous: Maryon Park, in Charlton. Some clever photography made this area of the park seem larger than it actually is, but it's still recognisable - only the fence has gone. One thing that stood out to me when I watched the movie was how empty the park was - it didn't seem plausible that there'd be so few people wandering around, but in actual fact, when I went up the hill to draw the above, there was no one around. Ironically, the whole time I was there, the only people who came past were a couple - I should have got them to recreate the poses of the photographs in the movie, but... they would've thought I was crazy. The last scene in the film was a memorable one - a mimed tennis match in which everyone playing and watching treats as real. Again, nothing has changed in 46 years, only the addition of a hedge. I rather enjoy revisiting places like this, that on the face of it have no real aesthetic appeal, that seem very ordinary and unexciting, but have a secret significance below the surface, accessible to anyone - all you have to do is look - and you find these places have been photographed, filmed or painted many years ago. Going back to sketch them is a way of engaging with this forgotten history. 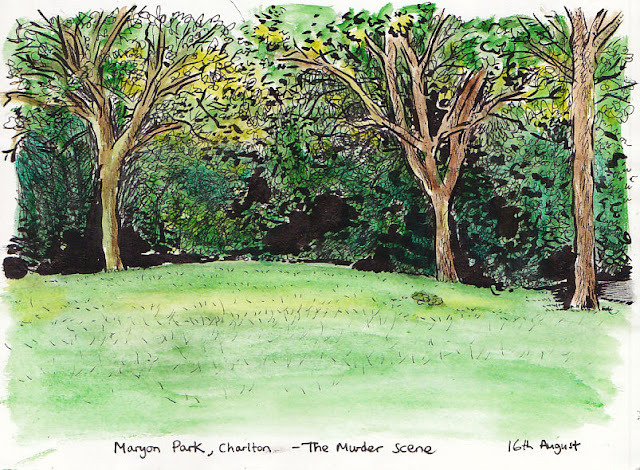 Last year I did the same with Pissarro's London paintings, when I discovered he had lived just a few miles away. 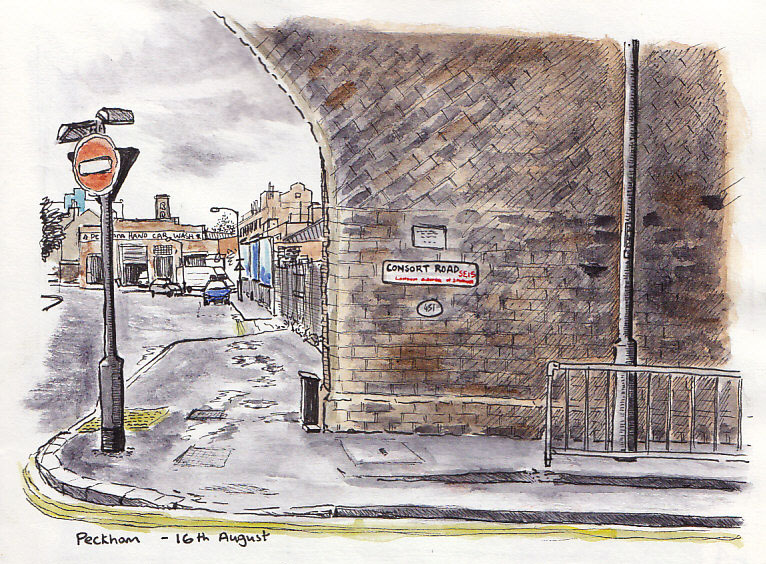 I searched for the places he had painted in the local area and drew them as they are today. A lot had changed, but it was fun to walk in the footsteps of a great artist. London is so rich in visual history, I'd be interested to know if other people have done the same, and if so, of what? 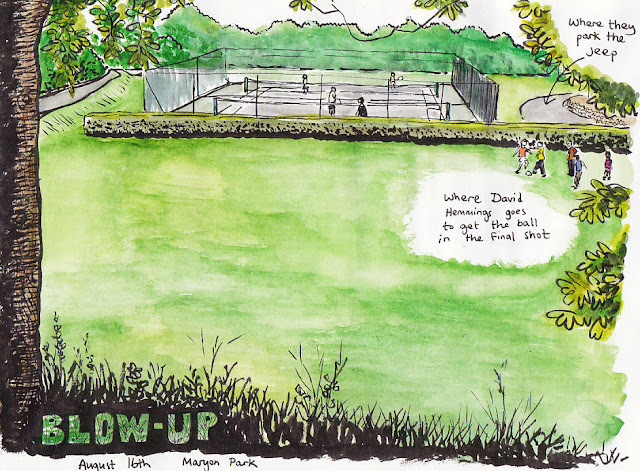 Next London Urban Sketchers Sketchcrawl ! Hi everyone. Following on from the great success of our first sketchcrawl organised by Pete Scully a couple months ago, I'm pleased to announce the second USk London sketchcrawl in Royal Greenwich, on Saturday September 15th. There's a huge variety of things to draw in a relatively small space - the Thames, a 19th century ship, bustling markets, the Royal Naval College, the park, churches, pubs, the observatory, deer, parakeets, the London city skyline, and many more things I've probably forgotten. There will still be some Olympic structures in the process of coming down/grass areas being reseeded for the next few months, but I've been assured by the tourist info that the park will be largely accessible by the 15th. I started this drawing from atop the hill almost a year ago, so I may have to go back and finish it off! There should hopefully be a mailout soon to everyone who gave their details last time. In the meantime, if you have any questions please get in touch via email or leave a comment below. 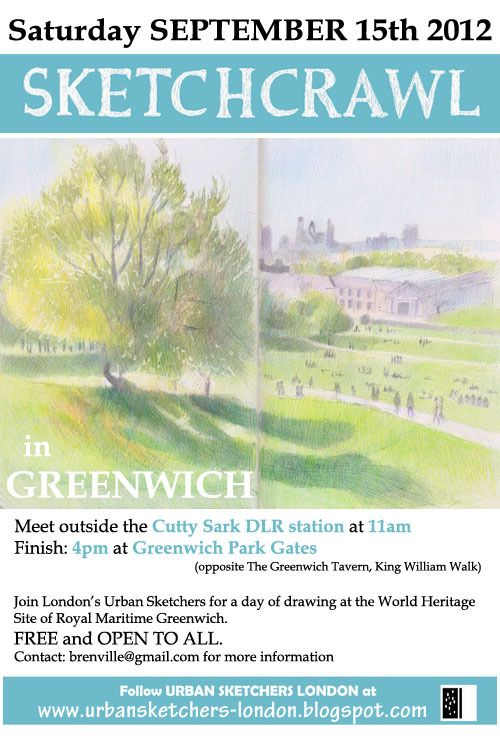 Look forward to seeing you all in a months time outside the Cutty Sark DLR station, 11am!